Whilst playing size and weight was never on my side, but the law was. 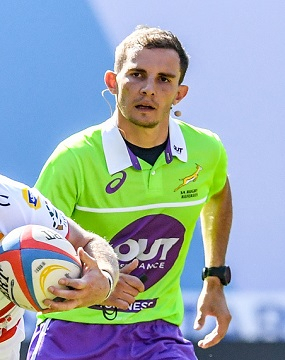 Started in 2012 at the Blue Bulls Rugby Referee Society. Dad was a big supporter of club and provincial rugby back in the day and always took me to the matches. Nephew played for Clermont Average in France. Work hard on and off the field, prepare for matches and always read/understand what the players are trying to achieve. Golf, Running, Cycling and Swimming. Currently preparing for Ironman 70.3 in June 2018.